I love the Mezze style of meal where you can try a little of what you fancy instead of wishing you had ordered your friend’s meal. I like the congeniality of sharing food, passing it around, letting the conversation flow, taking your time over the meal. There’s the smooth hummus paste of chickpeas, garlic and tahini, the Moutabal creamy aubergine puree, the tabbouleh salad of bulgar wheat, speckled green with parsley and fragrant with lemon. Then the little hot sausages of spicy minced meat, or the miniature flaky pastry fingers enclosing salty cheese, or the Labbneh yoghurt dip with lemon and mint. All these I enjoyed during my travels in Lebanon. But after a while, the mezze started to get a little repetitive. Let me explain. If you eat in a Lebanese home, you’ll get a totally different eating experience with a wide range of dishes and flavours. 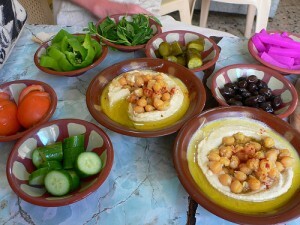 But in a typical local reaturant in Lebanon, the main foods on offer are a range of Mezze followed by different types of grilled meats, fresh fish cooked simply over the grill and fruit to follow. Grills can be nice and the fish was delicious but usually quite pricey, so for a light lunch we inevitably ended up with Mezze. Every day. I realised that it didn’t actually matter whether you payed top prices for your Mezze in a city restaurant or went cheap and cheerful in a backstreet cafe. The Mezze is almost always good and fresh because it’s such a staple.